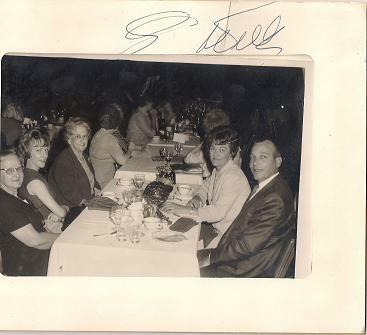 Souvenir Photo From Palladium In Hollywood Autographed By Lawrence Welk And Cast Members-1950's Price:$49.99+ $5.00 S&H This is a souvenir photo taken at the Palladium Theater in Hollywood, California in the 1950's. The people in the photo were attending a performance by Lawrence Welk and his Champagne Orchestra. 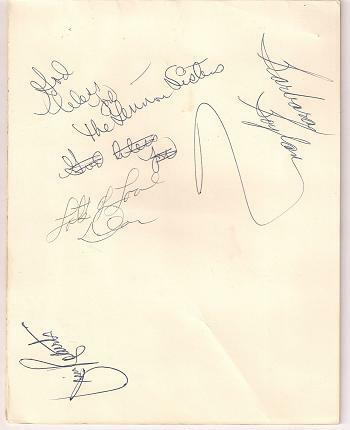 It is signed by Lawrence Welk, Barbara Boylan (dancer), Jim Roberts (singer), The Lennon sisters (singers), and Don (I think he is a member of the band). The photo, folder and autographs are in excellent condition.